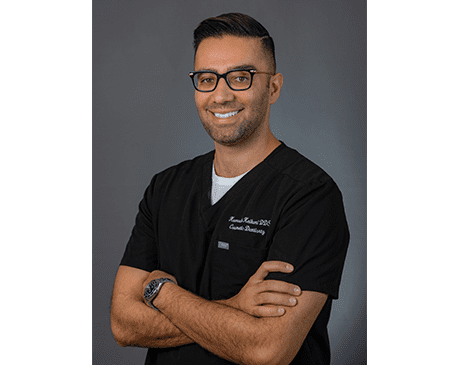 After completing his education at the prestigious USC School of Dentistry, Dr. Keihani worked as a general dentist in Beverly Hills, and more recently in Oxnard. In order to enhance both the health and appearance of his patients’ smiles, he offers a full range of general, restorative, and cosmetic dentistry treatments, keeping up-to-date on cutting edge technology, new dental procedures, and the latest advancements in the field of restorative and cosmetic dentistry. Dr. Keihani applies his extensive comprehensive dentistry experience to all his patients from youngsters to seniors, and continuously advances his clinical skills via continuing education courses. At the practice of Dr. Keihani, you can expect a comprehensive and gentle exam using state of the art equipment. Together with our friendly team, we will tailor a healthy smile using treatments that are fast, safe, effective, and more comfortable than ever before. Dr. Keihani is an active member of the American Dental Association, the California Dental Association, and the Los Angeles Dental Society.